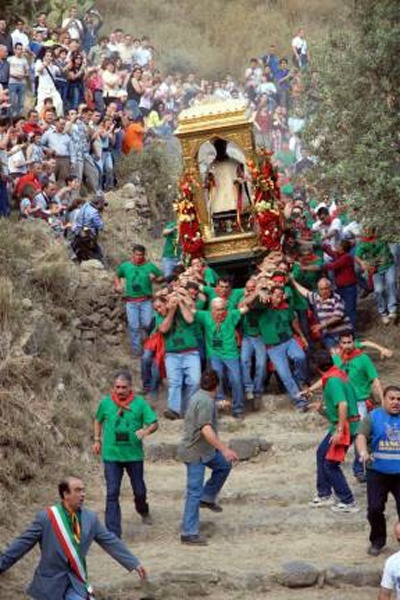 The most important festivals are the Easter procession and the celebrations marking the local patron saintâs feast day. Other celebrations include non-religious festivals such as the "Palio dei Normanni" which commemorates Roger's arrival at Piazza Armerina; festivals derived from pagan rites, such as the "Sagra della Spiga", at Gangi, with a procession dedicated to the ancient goddess Demeter; and festivals linked to a celebration of nature, such as the "Sagra del Mandorlo in Fiore" celebrating the blossoming of the almond trees at Agrigento and the "Sagra della Ricotta", at Vizzini. At the very mention of this islandâs name anyone with a keen ear for music will remember an ancient popular shepherdsâ dance, "the Siciliana", this was written as a handful of instrumental and vocal pieces in the 17C and 18C, the most famous singer of this is Ciccio Busacca, born in Paterno 1926, singer of the "Lament for the Death of Turiddu Carnivali" and "Train of the sun" , written by Ignazio Buttita with the collaboration of Dario Fo. The most spectacular festivals in honour of patron saints are those held in the large towns. In Palermo,"U fistinu" dedicated to Santa Rosalia lasts for six whole days: these are six action-packed days of boisterous celebrations with the slow yet triumphant procession of a float bearing the statue of the saint through the crowds . In Catania the citizens direct their hopes and aspirations to St Agatha, whose relics are contained in a precious silver bust of the saint, set with enamels and jewels, and who is carried through the streets for three days by the "nudi ", men dressed in simple jute sacks in memory of the fateful night in 1126 when the relics were brought back to the city from Costantinople and the citizens poured into the streets, jumping out of bed without taking the time to get dressed.